So far, the Tour of California has been the Discovery Channel/CSC Variety Hour, with guest stars Paolo Bettini and Graeme Brown. CSC has 3 wins, 2 by Juan José Haedo and one by Jen Voigt, while Discovery Channel has two by Leipheimer in the race's two time trials. So it's understandable the US squads were on the attack today on the circuit race in Long Beach. Danny Pate of Slipstream and Tim Johnson of HealthNet kicked off the day's big break, joined by Johnson teammate Karl Menzies, Pate teammate Steven Cozza, Toyota-United's Sean Sullivan, Priority Health's Ben Jacques-Maynes, and T-Mobile's Adam Hansen. At one point, Pate was yellow jersey on the road, but Discovery had plenty of help today from teams looking for a sprint stage win, including BMC, Credit Agricole, and Rabobank. Menzies was the final survivor with around 2 miles to ride. Pate would take the overall most-aggressive rider's jersey for his active role all week. From there, the ProTour teams worked to place their sprint specialists. CSC got on the front, with Rabobank trying to set up Graeme Brown and Gerolsteiner working for Robert Förster. At the line, the win went to Toyota-United's Ivan Dominguez, who found and attacked from Brown's wheel. Dominguez was brought over to Toyota-United partly to fill the gap left by Juan José Haedo, now riding for CSC, who took the points jersey for the overall tour. Levi Leipheimer wraps a wire-to-wire overall win in front of the home crowd. It's going to be very interesting to see how his season develops; this could either be his payoff for working for Basso at the Grand Tours, or the beginning of the big season he's worked for. Christophe Laurent took the King of the Mountains overall. Catching up from a couple of busy days, so these won't be news if you've been paying attention to the Tour of California. On Thursday, Paolo Bettini got his first-ever win in the United States. He narrowly outsprinted world under-23 champion Gerald Ciolek of T-Mobile, with CSC's Juan José Haedo third. Christophe Laurent of Credit Agricole joined a host of US continental riders for the day's primary breakaway, and therefore Laurent took over the lead in the king of the mountains competition. Also on board were Kirk O'Bee, Alejandro Acton, Aaron Olson Lucas Euser, Hilton Clarke, and Sean Sullivan. The peloton was content to let this group get away, and only Discovery Channel worked until very late in the stage, when Liquigas and Rabobank joined in to try and give their sprinters a chance. Finally, with 5 kilometers to ride and CSC driving the field, the break was captured. Ciolek was first around the day's last corner, with Bettini on his wheel, but there was no denying the rainbow jersey, who took a photo finish that had the top three spread over about a wheel's width. It was very hard for me to close that gap and the sprint was close by only a few centimeters. I was fortunate to have the power to come back to him today. He is very young and very fast and with experience he is going to be a very big rider." 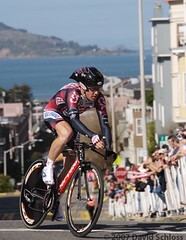 Levi Leipheimer maintained the race lead, although Jens Voigt threatened to gap the field while setting up Haedo for the sprint. So far, there are two sets of photos worth checking out at Flickr on today's Tour of California prologue: Leslie Veen's and David Schloss's. 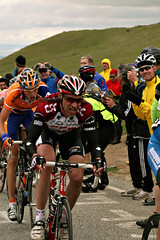 Ken Conley checks in, with my favorites, I think, being this shot of Leipheimer passing a shreiking bright banner. and this one of Stuart O'Grady, suffering up Telegraph Hill. Casey Gibson checks in at VeloNews, and I would say he's got one shot where he outdoes the master. More from Flickr: Great shot of Hincapie showing the colors by 1115; Saul Raisin working the crowd, by on2wheelz (who has dozens of good shots); and just look at all of Ken Conley's pics (warmup set/race set): I especially love Jason Donald with the big burrito, the Angel, and this shot of Chris Baldwin. Update to the update: Competitor.com has a nice gallery up, as does ProCyclingPress, a site I've never seen before. On a sweltering day in northeastern Italy, Paolo Bettini took the Italian road-racing championship, and will wear the Italian champion's jersey for the next year, along with his Olympic champion golden helmet. Bettini won in typical fashion, launching a strong attack with 10 kilometers to ride. Ten other riders bridged, including Danilo Di Luca and Stefano Garzelli of Liquigas, Pietro Caucchioli of Credit Agricole, Mirko Celestino of Milram, and Luca Mazzanti of Ceramica Panaria. The group of 11 stayed together to the line, and Bettini was the fastest, with Celestino barely behind, and Di Luca third. Joining Bettini will be Marzio Bruseghin, who won Wednesday's Italian TT championship. It was the first win of Bruseghin's career, and he'll be flaunting the maglia tricolore at the Tour prologue. Australia's Brad McGee is looking well-prepared for the Tour, as he took a sprint win on Stage 3 at the Tour of Switzerland today. Jan Ullrich continued in the race's overall lead, but McGee now sits just 2 seconds back, followed by Michael Rogers at 18 seconds. Last year, McGee had a disastrous Tour because of back, hip, and leg pain he said were initially caused by planting olive trees at his home. 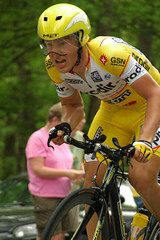 In 2003, McGee won the Tour prologue, but then abandoned, complaining of metabolic problems; later tests suggested he was making too much insulin, screwing up his blood sugar levels. At one point, McGee said 2005 was the year when he thought he could win the Tour's overall title; his good form has got to at least make him a favorite in this year's prologue. Olympic champion Paolo Bettini didn't take the start this morning, blaming stomach problems. "For the first time I started training for the Tour de France last October," he said. "I am continuing to make progress and in fact I think I am ahead of schedule." But unfortunately for him, there was a certain German wearing a certain yellow thingy around today. And "wearing" two great legs too, by the way: Jan Ullrich drove the chasing bunch into Sankt Anton, and poor Koldo was brought back with just 500m left. Then it was time for the sprint, and for Brad McGee to get proper reward for the perfect race he rode today. There were some notable performances with the Tour de France in mind. Spaniards Iban Mayo and Alejandro Valverde were both prominent in the front group, while Sinkewitz’s Quick Step team-mate Michael Rogers was also up there. Missing, though, was Joseba Beloki, who finished almost six minutes down and is now very short of time in which to rediscover his best form. F***! I f**king got over the hill no worries. None of the sprinters were left, I got on Bettini's wheel, he hit out early, I gave him a length, and I was f**in' absolutely cruising. Dropped it down the gears, ran at him, just about to blow his helmet off as I went past him...and he's just turned left and put me in the barrier. I had it won, I was just about to throw my hands in the air. Instead I did five somersaults down the road! Bettini: Tour "stepping stone to a gold medal"
"I'm not here to win the Tour but to work hard to peak at 110 percent in mid-August," he told Reuters. "The Tour is the biggest race in cycling but August will be the most important month of my season. Hopefully July and the Tour will be a stepping stone to a gold medal." Bettini, 3rd in the UCI rankings, has been riding strongly in support of Richard Virenque's quest for a 7th King of the Mountains title. Here's one for the old-timers in this Tour of youngsters, as 34-year-old Richard Virenque took a dramatic breakaway win. The Quick Step-Davitamon team leader maintained a fierce tempo as he closed in on a seventh Tour stage win received a raptorous reception when he rode into Saint-Flour after 6:00.24 in the saddle. The victory was France's 14th on Bastille Day since the war and the first since Laurent Jalabert's 2001 win. Quick Step's strategy in the King of the Mountains competition is now clear: They sent Bettini out in the race's early days to keep another rider from loading up on garbage KoM points, and used him today to keep anyone from limiting Virenque's gains by leading the field over the line. On the other hand, I'm not sure what Christophe Moreau of Credit Agricole was up to in grabbing the crumbs of the lowest king of the mountain placing; any ideas? You won't be reminded of it on OLN, but Virenque was the rider in the very center of the Festina affair that overshadowed the 1998 Tour. Today's stage is about 121 miles, with a 50-kilometer introduction to France before returning to Belgium for what's very likely to be a sprint finish. There are just two climbs, both 4th Category, on the course, and the finish in Namur is the first there since 1959. The course has a sharp turn 200 meters from the line, which might interrupt the Fassa Bortolo train, and disrupt Alessandro Petacchi's chance to get a sprint win. VeloNews tips Baden Cooke or Robbie McEwen, but I'm picking Tom Boonen, who pulled off in the last meters of yesterday's stage when he threw a chain, but looked to be in good position and riding well. McEwen will be motivated because he rides for a Belgian team, but Boonen is Belgian himself. Look for green jersey Thor Hushovd to contest a few intermediate sprints, trying to get enough time on Cancellara to take over the yellow jersey. Jens Voigt will ride in the red race numbers of yesterday's most aggressive rider. Fassa Bortolo showed they have more than one sprint threat, as Fabian Cancellara took the stage over Zabel, then Rabobank's Bram de Groot. Alejandro Valverde, the star of Comunidad Valenciana-Kelme, was 6th on the day, and active in the day's racing. Erik Dekker of Rabobank was 9th. Zabel remained number one in the world rankings released today, ahead of Alessandro Petacchi, Paolo Bettini (who dropped from 2nd), and Valverde. T-Mobile's Erik Zabel, a 6-time Tour green jersey winner and 4-time Milan-San Remo winner, made a rookie mistake on Sunday to blow his chance at a first victory this season, throwing his arms up in triumph before crossing the line, and letting Rabobank's Oscar Freire, world champion in 1999 and 2001, nip him on the finish line. Zabel adds to a string of second-place finishes this year, with Stuart O'Grady of Cofidis third, and Italian super-sprinter Alessandro Petacchi of Fassa Bortolo relegated to fourth, the first bunch sprint he's lost this year. Other results of note: US Postal's Max van Heeswijk was 5th overall, and George Hincapie of USPS was 13th. Defending Milan-San Remo winner Paolo Bettini, who tried to repeat last year's success with a breakaway attempt on the Poggio, couldn't stay away in a stiff headwind, and finished 8th. Petacchi made his move with 100 metres to go and Zabel followed suit before overtaking the "disappointed" Italian, who admitted he may have misjudged his final sprint. "I lost just like I did at Paris-Tours," said the Italian, who last season became the first ever rider to win at least three stages in all the Tours of Italy, France and Spain. "I had a great team around me and I've let them down. The Cipressa and Poggio (climbs) were raced at a very fast pace and I think I paid for that in the sprint, where my legs just gave out. "I think I probably attacked too early." Freire is now hoping to maintain his lead in the World Cup - with a view to taking the rainbow jersey from two-time defending champion Bettini. "Last year the World Cup jersey was my main aim, but I couldn't get near it," said Freire who should compete in all ten races this season except for Paris-Roubaix on April 11. "This time I hope to be able to maintain my run of results until the end (of the competition). I'm likely to meet Bettini a lot along the way, so it's not going to be easy." Zabel was second in his German champion’s jersey in San Benedetto yesterday but must surely realise that the odds are against him winning a fourth Milan-San Remo on Saturday. 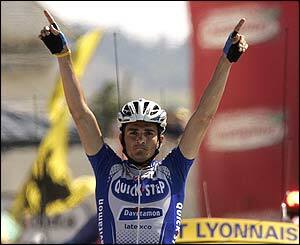 Petacchi’s sprinting in the first month of the 2004 season has been simply peerless. He is so far unbeaten in five bunch finishes since February. "I hope that I don’t lose my first one on Saturday," the 30-year-old Fassa Bortolo speed king remarked wryly yesterday. "I’d just like to go a bit better uphill: that’s the goal I’ve worked towards and the reason I’ve finished the Tirreno, despite the pain in my legs. To compare with 2003 I’d say that I’m stronger this year. Last year I was ill when I came back from Paris-Nice." "Everyone has seen how Petacchi is riding so I don’t have too many options: I either go clear with a group and back myself to beat them or, if it ends in a bunch sprint, I just try to earn as many World Cup points as possible." Roadcycling.com has full stage and final standings for Tirreno-Adriatico. Bettini's final margin of victory in the GC was only five seconds over Rabobank's Oscar Freire, with T-Mobile's Erik Zabel 3rd at 11 seconds and two Cofidis riders, Igor Astarloa and Stuart O'Grady rounding out the top five at 18 and 21 seconds. Zabel was second to Petacchi in the Stage 7 sprint finish, with Saeco's Gabriele Balducci third. Fassa Bortolo Alessandro Petacchi took the final stage at Tirreno-Adriatico today, and QuickStep-Davitamon's Paolo Bettini took overall honors. You would have to be nuts to bet against Petacchi at Saturday's Milan-San Remo. Paolo Bettini won an incredibly close sprint at Tirreno-Adriatico today to hold on to the race leader's jersey with one stage to race. With the win, Bettini leads Oscar Freire in the GC, but by only 7 seconds. Considering the winner's time bonus for tomorrow's stage, Freire could win the overall by taking the stage and keeping Bettini out of the top three. 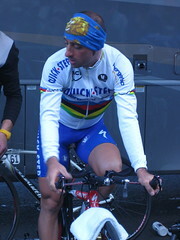 Bettini, of the QuickStep-Davitamon team, also won Saturday's Stage 4. He's the defending champ at Milan-San Remo, scheduled for Saturday, and clearly has the early-season conditioning to place well there.